Bonjour my readers! 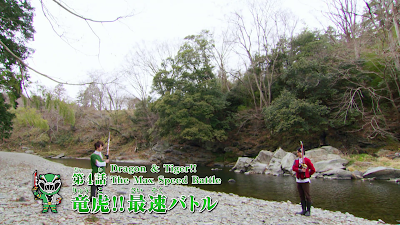 Well it's time for le obligatoire weekly Lupinranger vs. Patranger episode, isn't it? This week features le pistolet legendaire or the legendary pistol called le Lupin Magnum. 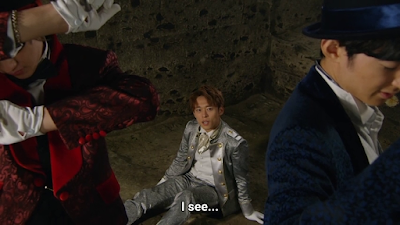 So okay, pardon me for doing some French puns yet again but again, where is le home of Maurice Le Blanc but France and where did Lupinranger vs. Patranger get le inspiration but Arsene Lupin? Le episode has some minor details then we get into le plot. Good Striker tells them that Noel is missing in search for le legendary Lupin Magnum. If I'm not wrong, le magnum gun was introduced in 1935 by Elmer Keith, Phillip B. Sharpe, and D. B. Wesson. That's a bit of historical tidbit there. Now on to the next. 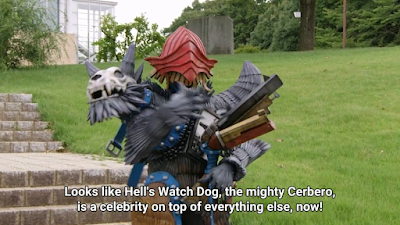 Well we've got a pun in Cerberus known as Cerbero. I almos read Cerbo from X-Men there. This new Gangler gets some guns. 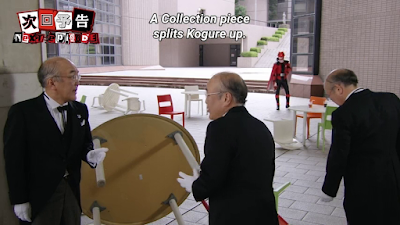 Also, he's got a Lupin Collection piece (which looks like Gosei Head from Goseiger) that allows him to manipulate earth. 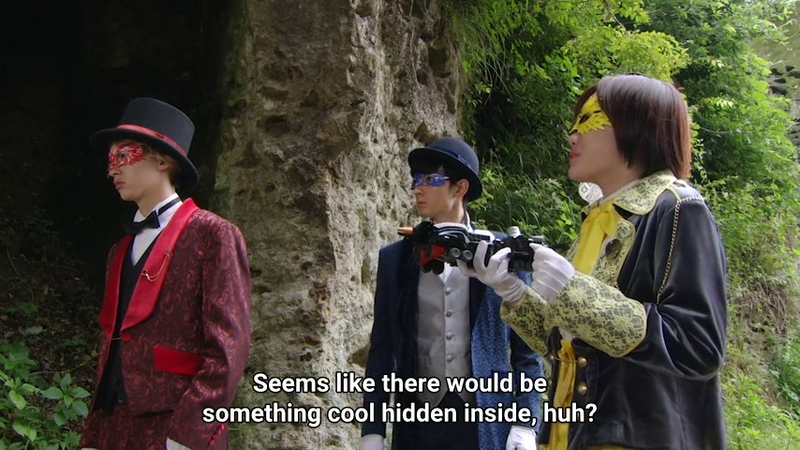 Le Lupinrangers and le Patrangers are both heading towards le cave of trials. They are ready to try and get their hands on le Lupin Magnum. But as said, it wouldn't be easy as they must face their greatest fears. Meanwhile, le Patrangers are doing some amazing shooting. Here's some good CGI and pyrotechnics. At this point, it's already part of me where I want to throw le joke that Michael Bay directed certain episodes of Tokusatsu for Toei because of le huge amount of explosions in certain episodes. 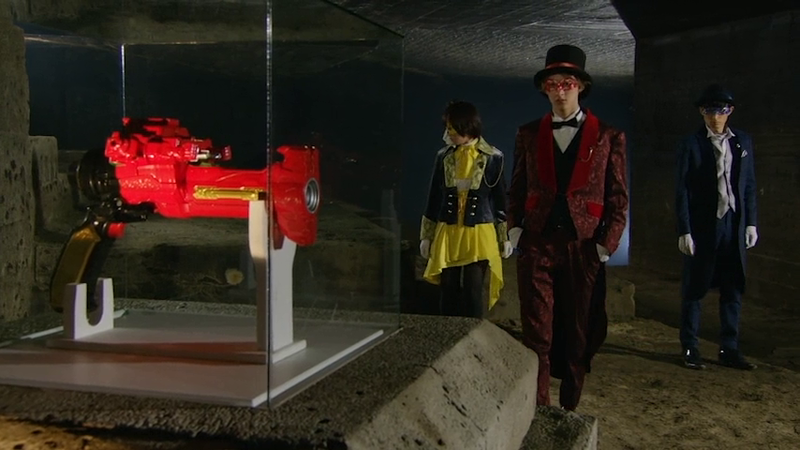 They meet le amazing Lupin Magnum. Okay, I could talk about some weirdness here. For starters, it's an oversized gun. However, it does pack a punch. Granted, it's Bandai merchandise and NOT a real gun so I guess as a plastic-made prop -- it must be very light to handle. But if it were really metal then you may need some real lightweight metal to make a magnum that big huh? Noel is found sleeping and later wakes up. There's a French phrase that says "break your shackles". Le Lupinrangers are presented with their deceased loved ones -- Tooma's fiance, Umika's best friend and Kairi's older brother. It almost presents a lesson that sometimes you just need to make sacrifices for le greater good. I still think about how Kairi manages to win le challenge. 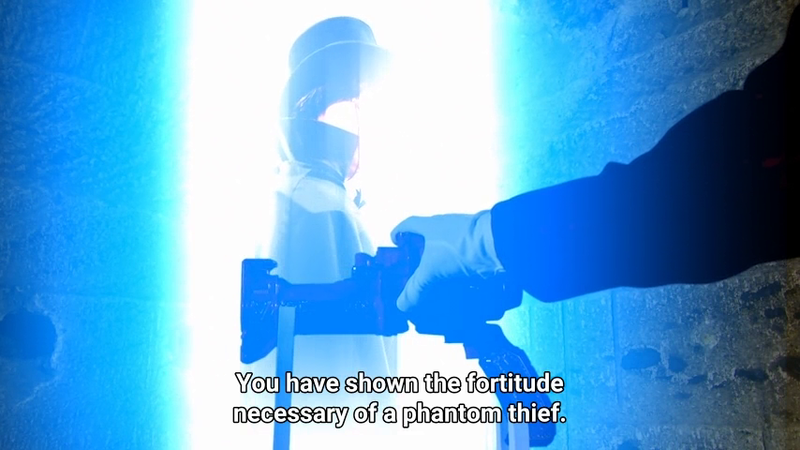 A hologram (or maybe a ghost) of Arsene Lupin shows up. Question is when did Arsene learn to speak Japanese in his lifetime? 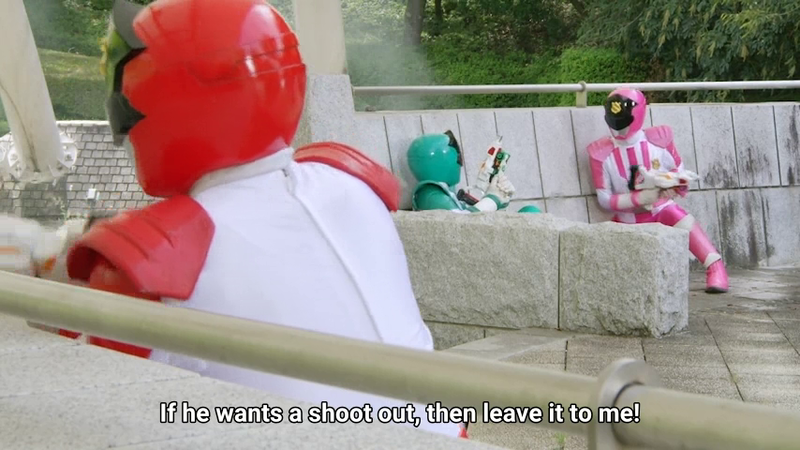 I guess this is a bit of a plot that Lupinranger vs. Patranger added and deviated from Le Blanc's original novels. After all, wasn't Lupin III a guy who's half-Japanese and half-French, right? There's more explosions going on. 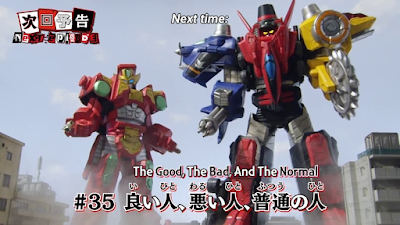 Yup, it turns out that le Lupin Magnum can also combine with le VS Changer to form a deadlier weapon. 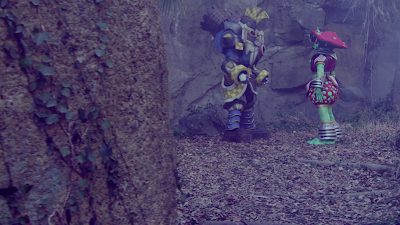 After some amazing explosions Bay-style -- we get le coolest scene yet. It's one amazing explosion. Also, we see this combined weapon in giant battle. 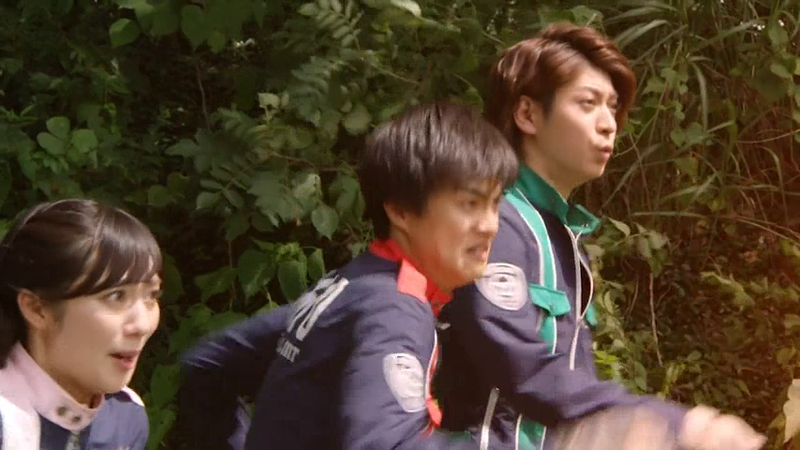 Also, I can't help but display le shocked reactions of le Patrangers in human form. 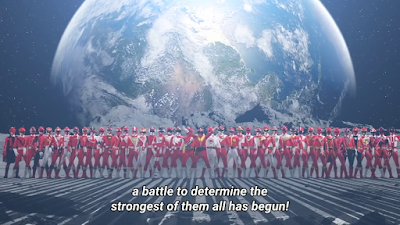 IMHO, it would be very funny if they were actually saying, "Oh F*** this episode was directed by Michael Bay!" They nearly get carried away by le explosion. 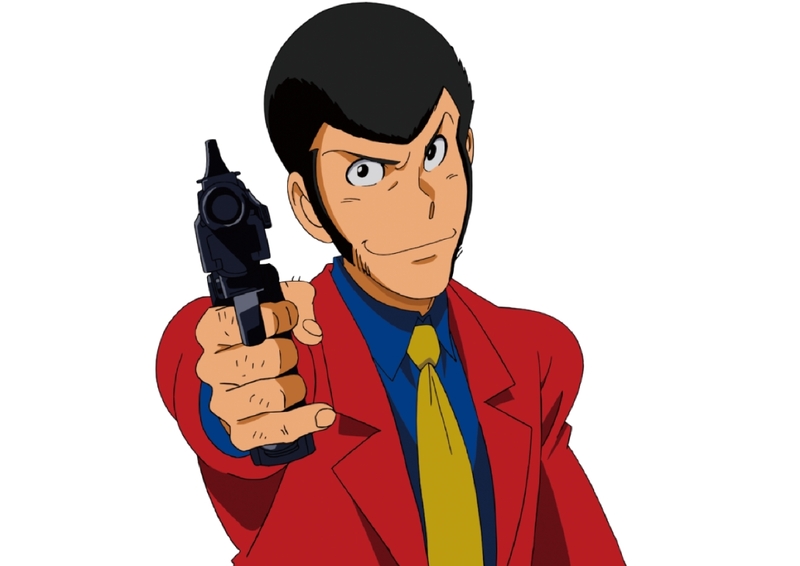 So it turns out that le Lupin Magnum will be used in battles. Meanwhile, Umika wants to see le weapon but Kairi refuses. 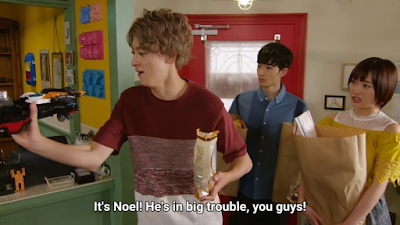 This also has me wondering if whether or not a potential rivalry between Kairi and Noel is coming forth. 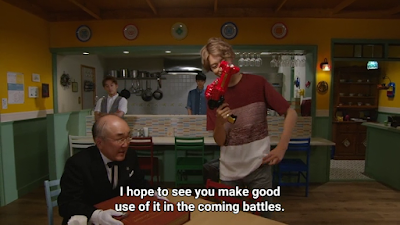 I even think that Noel (who might as well be a descendant of Lupin) is probably trying to preserve his ancestor's name one -- but it was Kairi who got worthy of le favorite piece of Lupin's collection. Next week should be a funny episode. 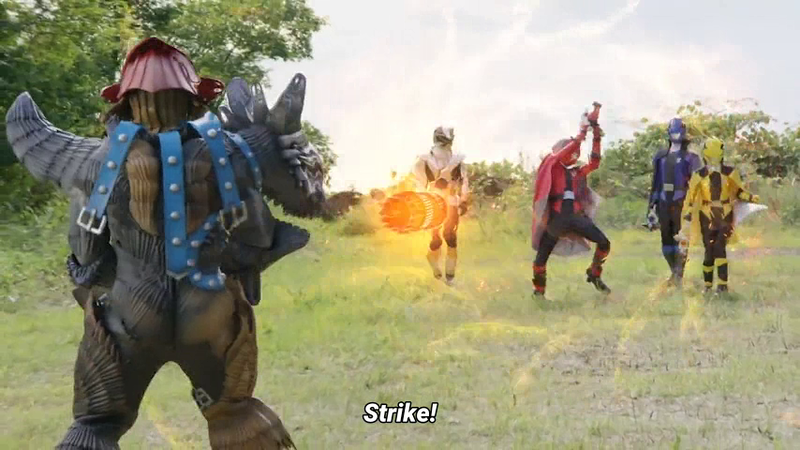 Kogure gets split up into three. Worse, they must get all three together or he'd die. Hmmm... talk about absurd and I expect next week to be highly chaotic fun! Also, we should get a new mecha which is le Lupin Magnum's robot mode. It looks pretty cool actually! I can't wait to see le next week's episode. 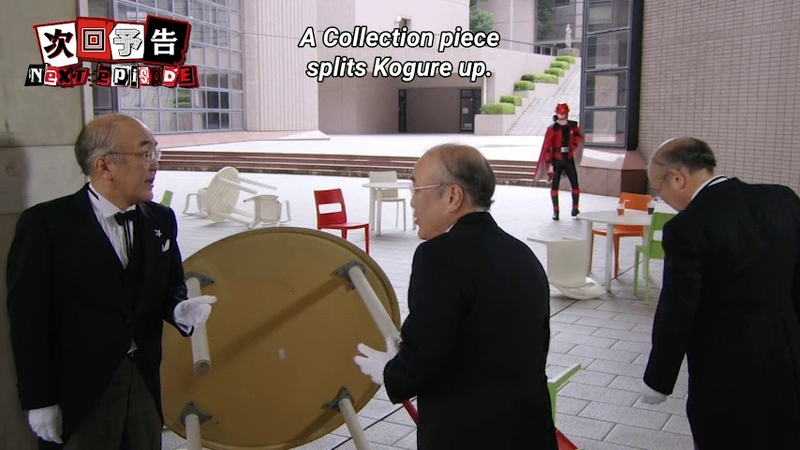 Hopefully, Lupinranger vs. Patranger will catch on with toy sales! So, this guy come again as comedic character.